So you’re injured. You know you’re not going to get up to bat. You know you’re not going to throw a pitch or take a ground ball or have an at bat. Does this mean that you won’t be able to help out your team because you physically can’t do anything? NO WAY! Just because you cannot physically be out on the field playing does not mean that it’s okay for you to mentally check out and be uninvolved during a game. To me, the selfish thing to do as a player is to not help out your team and not stay involved. Don’t be a distraction in the dugout or at practice just because you are not taking reps or getting at bats. Your job as a teammate changes whenever you are injured. Don’t be a selfish teammate. 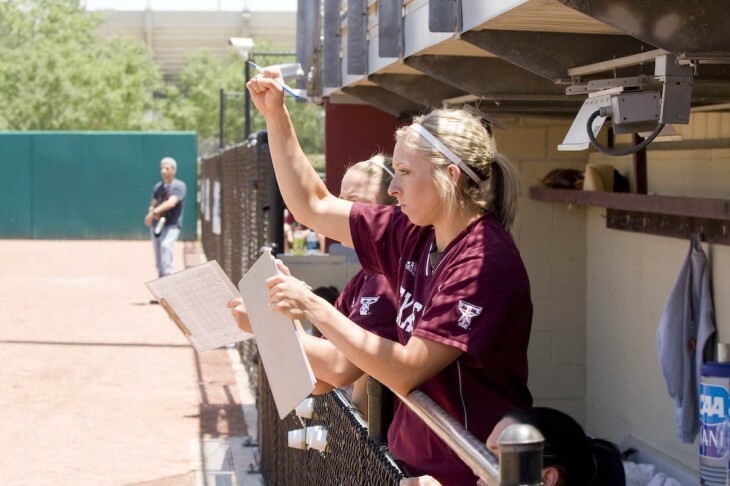 If you are a distraction in the dugout, you are making things about YOU and not about your TEAM. The team always comes first. The team is bigger than you. Chart pitches of the opposing pitcher to look for tendencies (Example: every time the opposing pitcher gets 2 strikes, she throws a change up). When you are in the dugout, and your team is on defense, and there is a runner on first base, your job is to watch that runner to be able to shout to your catcher if the runner is going or not. 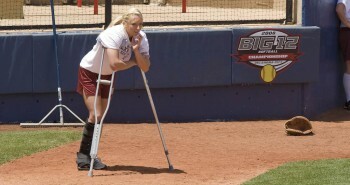 Every pitch, you can make it your job to be a helper for the catcher to let her know what that runner is doing. Also, when you are in the dugout, and your team is on defense, and there is a runner at 3B, your job can be to watch the runner at 3B to see if the other team is running a squeeze. If you see that runner at 3B take off on the pitch to try to head home, yell “squeeze” as loud as you can so that you can help give your infield a heads up to be on top of the play at the plate. Help your pitcher, catcher and defense remember who is coming up to bat next inning and where they hit it. Say the leadoff hitter comes up to bat for the 2nd time in the game, and she hit it to your centerfielder, Jami. You yell, “Hey Jami! She came to you last time.” Help your defense stay in the game and remember the play that happened before. When your team is hitting. and everybody is in the dugout, make it your job to try to pick up any signals from the opposing coach or catcher. Try to figure out the other team’s signals so you can help out your hitter. Even the catcher may be showing everybody her signals by not keeping her hand close to her while she is giving signals. If you can see them, try to figure them out to help give your teammate an advantage up at the plate. When your team is hitting, take a look at the pitcher and see if she has any tendencies with her body when she throws a certain pitch. Maybe before she throws a changeup her head tilts a certain way, or you can tell she gets a special grip in her glove. Consider it a challenge that you are going to sit there and watch that pitcher to see what exactly she is giving away. All pitchers give away information every single pitch – it’s up to you to be able to identify it. Another job that you could help do, is when your team is on defense and you are in the dugout, help get the 3 hitters who are due up the next inning’s gear ready for them to come into the dugout to slip on – heltmet, batting gloves and bat. You can have that at the front of the dugout ready for them, so they can come in and make a quick transition to go up to bat. Help them get focused sooner. If your coach calls pitches from inside the dugout, and you are a pitcher or a catcher, go sit by that coach. Ask what he/she is calling and why they are calling it. Learn how to set up hitters. Be a sponge. Even though you are physically not throwing pitches and getting better physically, you learning how to set up hitters and learning a method behind calling pitches is going to make you a stronger pitcher or catcher once you are healthy and get back out there. Be the your team’s biggest cheerleader. More than that, be a leader. Be supportive of your teammates, keep them up in the dugout. If someone had a bad at bat or seems down during the week, try to have a talk with them and bring them back to being more positive. What will speak the most about you and your character is the communication and support that you have towards that person who is in your spot. Say, you you’re usually the starting short stop, but you can’t play because you rolled your ankle. Now, the back up short stop is in, who doesn’t have that much experience. You can take it upon yourself to help her know where to be in all situations. Coach her throughout the game and monitor over her to make sure that she is always in the right spot. Also, give her encouragement or any kind of helpful hints that you know from playing that position. You now become that new short stop’s biggest fan. You want her to do well, because if she does well, then your team has a better chance of winning. Make it your job when your team is hitting to make sure that whoever is supposed to be on deck is ready and knows that their turn to bat is coming up. Make sure there is always someone on deck and always someone in the hole. Help your teammates be ready and focused so they have the best possible chance to have success when they are up at the plate. Overall, it just comes down to being a student of the game. Study hitting, pitch calling, body language, situations. When you cannot play, you can go into more of a coaching/observation role to help take your game to the next level. Read the defense when your team is on offense. A lot of times teams have their middle infielders or outfielders shift depending upon which side of the pate the pitch is going to be. So sometimes the defenders are giving away to the hitter which side the pitcher is going to throw to. Example: A right handed hitter is up, you see the short stop move more towards 3B, and the centerfielder move more towards LF before the pitch is thrown. They’re positioning themselves for an inside pitch to come to the hitter). Look for this, and if you notice it, make sure you call together a little team meeting and tell your teammates what you see. 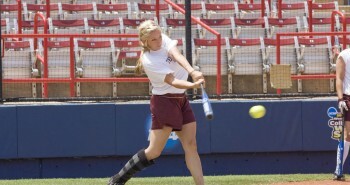 You may be able to pick something up, to once again, help your teammate deliver a hit while she is up to bat. It might even be the game winning hit that you help her get. What do all have these things have in common? You’re still contributing to helping your team WIN. By finding ways to still contribute, you are putting attention on the team and taking attention off of yourself. Put your team before you. Even if you are injured, you are still a part of a team.